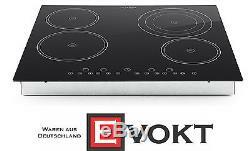 Klarstein Virtuosa Ceramic Glass Hob Built-In Oven Cooker 6500W Genuine New. The Klarstein Virtuosa ceramic hob combines modern technology with a luxurious appearance to bring a new sheen to your kitchen. Three cooking surfaces with diameters of 2 x 16.5 cm and 1 x 20 cm as well as a Vario cooktop for pots with a diameter of 12-23 cm offer a total of 6500W of power for cooking the contents of your pots and pans. 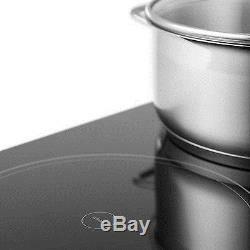 The two small hobs with up to 1200W each, the large hob with up to 1800W and the Vario hob with 800, 1600 or 2300W power depending on pan size can be separately adjusted in 9 temperature levels. The Klarstein Virtuosa built-in ceramic cooker is operated with a built-in touch sensor panel with digital display, so that no additional controllers or buttons break through to disturb the surface of the kitchenette. In addition to the temperature, each hob features an adjustable timer that can be programmed in one-minute or 10-minute increments, after which the hob will switch off automatically and alert you with a beep. So that cooking will always go smoothly, the Virtuosa built-in cooker has a variety of backups: an overheating protection activates should the hob get too hot. A residual heat indicator tells you whether switched off cooking surfaces are still hot. A child safety lock can be activated to prevent accidental changes to the cooking settings. Visually, the Klarstein Virtuosa ceramic hob cooker blends easily into any kitchen, whether classic or modern, thanks to its black easy-care glass ceramic surface. 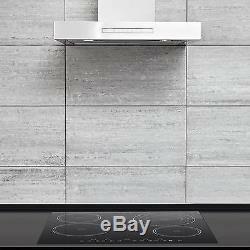 MAIN FEATURES AT A GLANCE Luxurious modern ceramic hob for installation in a kitchenette Four hobs with diameters of 16.5 cm, 20 cm and 12-23 cm and a total output of 6500W Two hobs with 1200W, 1800W and one with a Vario cooktop with 800, 1600 or 2300W, separately adjustable in 9 temperature levels Easy-care black ceramic glass surface with sensor touch control panel and hob marks Adjustable timer with acoustic signal and automatic shut-off. THE CHARACTERISTICS On / off switch on top of the device Total power: 6500W (2 x 1200W, 1 x 1800W, 1x 800, 1600 or 2300W) Hob diameter: 2x 16.5 cm, 1 x 20 cm, 1x 12-23 cm Sensor touch control panel with digital display for fan speed and timer Timer in minute or 10-minute increments up to 99 minutes Automatic shutdown Overheating protection Switchable child safety lock Built-in oven: designed for installation in a kitchenette, not a standalone unit Includes mounting hardware for installation in the kitchenette 5-pin cable Power supply: 220-240 V / 50-60Hz. WHAT IS DELIVERED 1 x built-in cooker 1 x installation material 1 x English user manual (other languages: German, Italian, French,ish). THE DIMENSIONS Total dimensions: 59 x 5.2 x 52 cm (WxHxD) Installed dimensions: 56 x 4.7 x 49 cm (WxHxD) Minimum width encircling worktop: 5 cm Minimum distance from overlying kitchen slopes: 76 cm Cable length: 1 m Weight: about 8.1 kg. Please read our terms and conditions before purchasing from us. And/or ask for photos of the product as proof of the return reason before accepting it. Customers are responsible to cover the cost of returning the package if the return reason is change of mind or order by mistake. No alternative methods are allowed. Please note that our products are coming with European Sepcifications and/or with European 2 PIN plug. The item "Klarstein Virtuosa Ceramic Glass Hob Built-In Oven Cooker 6500W Genuine New" is in sale since Tuesday, June 07, 2016. 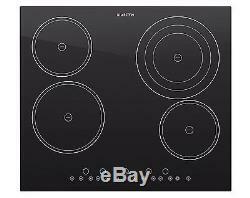 This item is in the category "Home & Garden\Major Appliances\Ranges & Cooking Appliances\Cooktops". The seller is "evokt" and is located in Berlin.